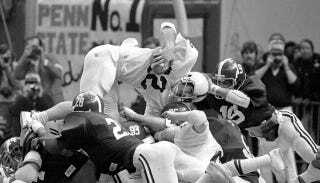 The showcase game this afternoon is Alabama heading into Happy Valley to face Ole Joe and his Nittany Lions. Game's on ABC, throwback style. Other 3:30 p.m. games: No. 6 Stanford at Duke (ESPNU), No. 11 Virginia Tech at East Carolina, Nevada at No. 13 Oregon (FX), No. 25 TCU at Air Force (Versus) and Cincinnati at Tennessee (ESPN2). The Gamecocks head southwest to play Georgia in the 4:30 p.m. ESPN game. That should be fun, too.